Authorities in Uganda should immediately drop charges of incitement and malicious damage to property against two journalists and investigate allegations that security personnel on August 13 and August 14 assaulted members of the press reporting on political unrest in northern Uganda's Arua District, the Committee to Protect Journalists said today. Herbert Zziwa and Ronald Muwanga, journalists with the privately owned NTV Uganda, were on the night of August 13 assaulted by security personnel and arrested during their live coverage of unrest in Arua District, according to a reportby the press rights group Human Rights Network for Journalists-Uganda (HRNJ-U), and Zziwa, with whom CPJ spoke. They were detained overnight and charged on August 14 with incitement to violence and malicious damage (to property) before they were released on bond, according to Zziwa and a document seen by CPJ. Also that night, security personnel assaulted and harassed Julius Bakabaage, John Kibalizi, and Benson Ongom, journalists with the privately owned NBS Television who were reporting live from the same location, Ongom told CPJ. On the morning of August 14, soldiers threatened the same crew of NBS journalists and confiscated their equipment, Ongom and Bakabaage told CPJ. Ongom also told CPJ that he suspected that security personnel had tried to use Zziwa's phone, which was taken during the arrest, to lure him and his colleague into a meeting. "Journalists reporting in crisis zones should do so without fear that the security personnel that are supposed to look out for their safety will turn on them and assault them. The charges brought against Herber Zziwa and Ronald Muwanga are also groundless, suggesting that authorities are trying to legitimize the arrest and assault of these journalists," said CPJ's sub-Saharan African representative, Muthoki Mumo. "Ugandan authorities should immediately drop the charges and ensure those responsible for violence against journalists are held accountable." Chaos and violence erupted on the evening of August 13 in Arua following a day of political campaigning ahead of a parliamentary by-election, according to Reuters. President Yoweri Museveni's convoy was stoned and Yasin Kawuma, the driver of MP Robert Kyagulanyi, also known as Bobi Wine, was shot dead, according to media reports. Policearrested around 34 people in connection to the chaos, including at least four members of parliament and the two NTV journalists, according to a report by the privately owned Daily Monitor newspaper. Zziwa told CPJ that he, Muwanga, and cameraman Jeff Tumwesigye were reporting live from the Pacific Hotel, where the driver had been shot, when security personnel confronted them. 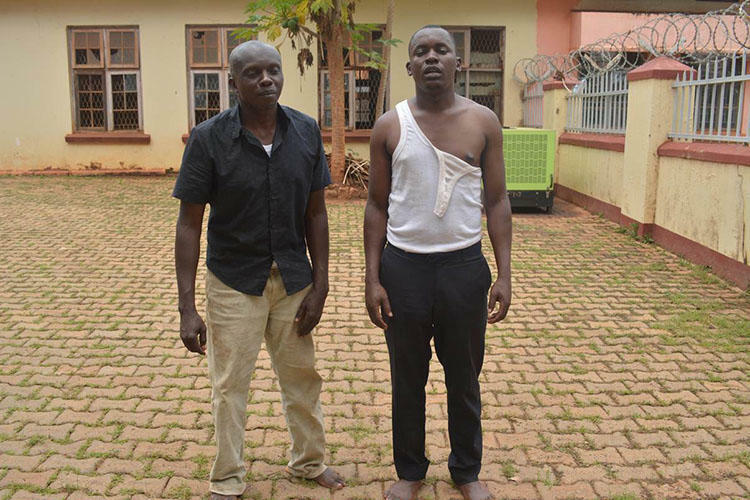 The security officers, whom Zziwa could not identify as belonging to any specific security agency, went after Muwanga, who was holding a camera light, and started beating him with sticks and their fists, Zziwa and Ongom, who also witnessed the incident, told CPJ. Tumwesigye, the cameraman, ran to safety, according to a report by NTV Uganda. Zziwa, who had initially tried to help Muwanga, also decided to flee to safety but ran into another group of about five security officers who beat him with sticks, slapped him, and kicked him. He told CPJ that he escaped them, running towards a nearby security van with intention of surrendering himself for arrest to avoid further assault. Zziwa said that he found his colleague, Muwanga, already detained in the vehicle. Zziwa told CPJ that military personnel operating the security van used a rope to tie him together with Muwanga and two other individuals. These soldiers confiscated their phones before driving them to two unknown locations, according to Zziwa and a statement from NTV Uganda. At around 1:00 am on August 14, they were taken to Arua central police station where they were handcuffed, and then they were driven around 250 kilometers to Gulu central police station, where they spent the night and were charged in the morning, according to these same sources. Zziwa told CPJ that he and Muwanga suffered minor injuries to their backs and heads. They were ordered to appear today at Gulu Police Station, where police extended the journalists' bond to August 27 and ordered them to appear again at the station on that date, according to a copy of a document shared by Zziwa on his Twitter account. Zziwa told CPJ they have been directed to pick up their phones at Arua police station. The crew of NBS journalists was also reporting live from Pacific Hotel on the night of August 13 when security personnel assaulted their cameraman, Julius Bakabaage, beating him on his back and head with the butts of their guns, Bakabaage and Ongom told CPJ. Ongom and the third member of the NBS crew, reporter John Kibalizi, escaped by running away from the officers, according to these same sources. Ongom told CPJ that later that night, between 8:45 PM and 9:00 PM, he and Kibalizi received phone calls from someone claiming to be Zziwa, the arrested NTV Uganda journalist. The caller was using Zziwa's phone number and asked the journalists to bring their equipment and footage to a room at the Blue Dove Hotel in Arua. However, Ongom told CPJ that they were suspicious, since they had witnessed Zziwa's arrest earlier in the evening, and did not go to the hotel room. Daily Monitor, a publication that shares a parent company with NTV Uganda, reported that Zziwa's colleagues had that night received calls made from his phone by "unknown people." Zziwa told CPJ he did not know about these calls. The NBS crew went back to report from Pacific Hotel on the morning of August 14 but a group of Special Forces Command officers, an elite arm of the military, were blocking the road, according to Ongom and Bakabaage. Unable to access the hotel, they started setting up their equipment at a distance from the soldiers, with the intention of reporting live. However, three of the soldiers ran towards them, threatening them with guns and telling them to stop filming, according to these same sources. All three journalists managed to get away though their equipment, including a camera and a tripod, was confiscated, Bakabaage told CPJ. They recovered the equipment from Arua central police station that evening, according to Bakabaage and Ongom. Military spokesperson Richard Karemire today told CPJ that it was "regrettable" that the journalists had been "caught up in this fracas." He declined to discuss specific allegations of assault but said that the military would investigate any formal complaints filed with them. Police spokesperson Emilian Kayima told CPJ that journalists were not specifically targeted in Arua. He said that "all issues would be looked at and sorted" though he said he could not commit on whether the case against the two NTV Uganda journalists would be dropped. He did not respond to CPJ's question about whether police had used Zziwa's confiscated phone to call other journalists.